I can't seem to get the "Upload" to work properly in Dreamweaver. The form was integrated using the Dreamweaver button, in the embed form wizard. The form works properly on it's own web page (the direct link). But, in Dreamweaver, it doesn't even look like it's trying to pull the file (that is, the spinning arrows don't appear when I use the form in Dreamweaver - but they do appear when I use the form in the direct link). 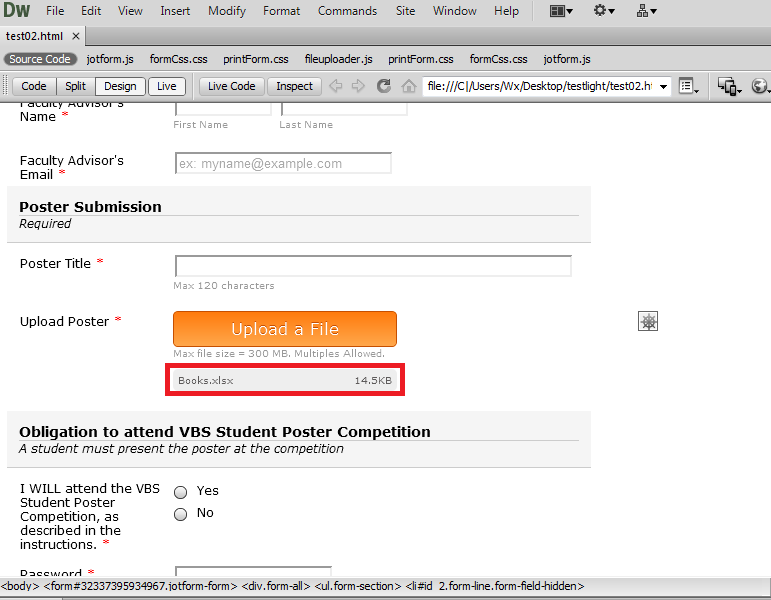 and then click on "submit poster" at the top (sorry - I can't link directly to the page, because I'm masking the domain name). Hello, I've tried the direct website form and it does get past the revolving arrows. Also, I tried to replicate the error on Dreamweaver, but I do get the revolving arrows and then the file size on Dreamweaver - Live Mode. I'm not to sure what may be going on. And I will do further research on Dreamweaver issues related to this. If I do find anything regarding this, or if one of my collegues has a solution for this, we will continue to post it here. I would suggest trying to post the Dreamweaver form code on a local local html file and additional html file on the server, just to see if you get a different behavior from the form and Dreamweaver. If you do have any updates from you end, do let us know. If you do need assistance on an unrelated matter to this, please post on a new thread to keep this one related to the matter at hand. Thank you.